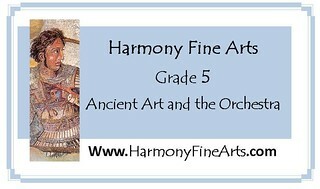 Harmony Fine Arts Grade 5 – Ancient Art and the Orchestra is a 32 week long plan for art and music appreciation that you can use with ease in your homeschool. If you use these plans in your family, you will have each week planned ahead of time with little effort. The plans are flexible and you can choose from three different options for art appreciation. You can choose to complete one, two, or all three of the options depending on your available time and interest. If you would like more specifics for these plans (art time periods covered and specific composers), you can click over to the Ancient Art and the Orchestra entry for more information. This entry will illustrate what a typical week will include if you choose to follow the plans. Sample pages and resources lists for every level of Harmony Fine Arts are found on the website: Resources and Samples. Note that your study of Prehistoric Art will stretch out from week 1 to week 4. Use the link provided to view the artwork of the week: Cave Paintings (scroll down the left side until you get to “cave paintings” and click. Click to view images. Note to Parent: If you want to read through the introductory notes on this page you will glean some nice cave painting facts. View the images and print one out for your notebook if you desire (instructions in the ebook). There is also a Prehistoric Art notebook page included in the plans for you to add your print to as well as record any facts you glean as you study Prehistoric Art for the next four weeks. Make your own cave art: Using brown crumpled paper and oil pastels or crayons, copy one of the cave paintings from the book for you art notebook. Read Lesson 1 and 2 in Artistic Pursuits Grades 4-6 Book 1. Complete the Try It suggestion (pencil sketch), view the art print in the book, and then complete the drawing suggestion in Lesson 2, remembering to fill up your space. File your work in your art notebook and at the end of the unit use the evaluation sheet at the back of the Artistic Pursuits book to evaluate your work (if desired). Your family can choose to do just one option or combine options together to get a richer art appreciation experience. Please Note: Many families combine Option 1 with either Option 2 or 3. You can choose from week to week how much to include in your lesson. Read pages 7-14 in Story of the Orchestra. Listen to tracks 1-2 on the accompanying CD. This section gives an overview of the book, introduces the Baroque Period, and Vivaldi. Read pages 42-49 in Story of the Orchestra which is all about the string section in an orchestra. Listen to tracks 13-18 on the accompanying CD. Record information on the stringed instrument notebook page. Note: You will begin listening to the Instruments of Classical Music (Cello) next week. Read pages 92-93 in Story of the Orchestra about the orchestra’s conductor. See my Harmony Fine Arts Grade 5 page for more specifics for this plan for art and music appreciation. You can print out the sample for a list of artists and composers included in this ebook, a list of materials and resources needed, supplies list, and four weeks of plans to examine. 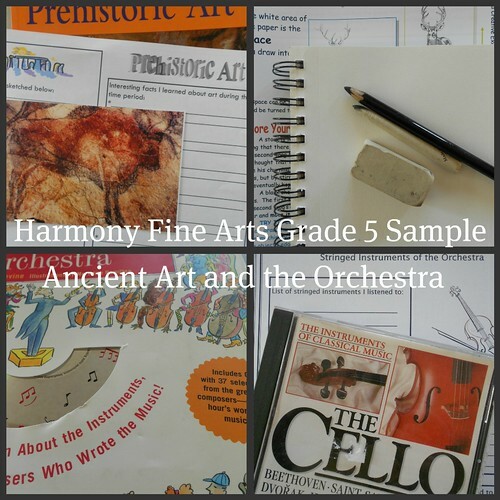 You can click over to purchase the Harmony Fine Arts Grade 5 ebook or print version plans HERE. $17.44 for ebook version of these plans. 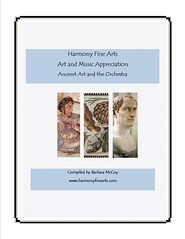 Please note there is no print version available for Harmony Fine Arts Ancient Art and the Orchestra.